File Indiana basketball player Bill Garrett broke the Big Ten's color barrier 70 years ago. When Indiana takes the court this afternoon at Assembly Hall, it will be making a fashion statement. The Hoosiers, who will try to win for just the second time in 10 games when they meet Ohio State at 1 p.m., will be wearing specialty uniforms and shoes to celebrate Black History Month and the legacy of trailblazing former Indiana center Bill Garrett. The uniforms are part of the “Harlem Renaissance Collection” unveiled by Adidas for February's Black History Month. The Indiana women's basketball team wore uniforms from the collection on Wednesday when it played Minnesota. “As the university that broke Big Ten Basketball's color barrier 70 years ago, Indiana University is very proud of its leadership role in racial integration and the social justice it reflects,” athletic director Fred Glass said in a statement. 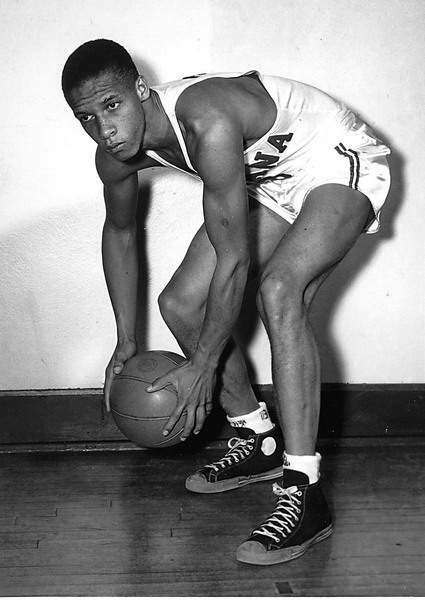 Glass is referring to Garrett, who became the first black basketball player in the Big Ten to start a game when he suited up against DePauw on Dec. 4, 1948. The Shelbyville native was the 1947 Indiana Mr. Basketball and went on to a starring career with the Hoosiers, earning All-American honors in 1951 and leaving as the school's all-time leading scorer with nearly 800 points. A statue of Garrett, alongside then-Indiana coach Branch McCracken, was added to the front entrance area of Assembly Hall when the arena was remodeled in 2017. The Hoosiers will wear shooting shirts with Garrett's silhouette on them during warmups. “Bill Garrett being a pioneer, he was the first one to come here and be accepted and be able to play here at IU,” senior forward Juwan Morgan said in a video released by IU Athletics. “He was the one that broke that barrier, just gave us all really the confidence to be able to not be looked at any different. Garrett went on to serve in the U.S. Army and played briefly for the Harlem Globetrotters. He then coached Crispus Attucks High School for a decade, leading the team to the state championship in 1959. Garrett died in 1974, just months after being enshrined in the Indiana Basketball Hall of Fame. In addition to honoring Garrett, the uniforms the Hoosiers will wear against the Buckeyes also celebrate the Harlem Renaissance. The jerseys will be the usual cream and crimson colors, but will also feature a “bean stitch” texture on the front of the jersey and the word “Ballroom” on the waistband of the shorts. The latter references Renaissance Ballroom and Casino in Harlem, a complex frequented by some of the best black basketball players in New York in the 1920s and 1930s. Indiana will also don specialty shoes that are mostly black with pink and purple accents, which “echo the colors of the jazz ballrooms so important to the era,” the athletic department said.